Abstract: Recent years have seen much of Transmeta's long-battery-life thunder stolen by Intel's vastly improved mobile chips. The Efficeon includes an AGP 4x interface as part of the traditional northbridge components that are now built into the CPU itself. 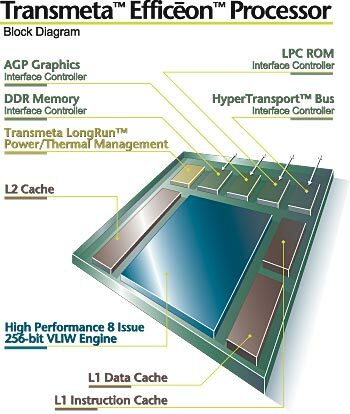 The use of 4x AGP instead of the current 8X standard points to the Efficeon's intended use as a processor for ultra-light notebooks. Battery life is the primary concern, performance and features following after that, with graphics and game play not being much of a concern at all. To be fair, 4X is perfectly adequate for today's mobile graphics chipsets, and it seems likely that PCI-Express will usurp AGP as the graphics interface of choice sometime in 2004 in any event. With its hypertransport capability, the Efficeon should be well placed to take advantage of any notebook specific PCI Express graphics technology. The final built-in feature of the Efficeon processor line is the presence of an onboard memory controller and interface. This supports DDR SDRAM memory at speeds of 166MHz (333Mhz DDR). By having the memory controller built directly into the processor die, as seen on AMD's Athlon 64 and Opteron processors, performance bottlenecks can be reduced. This is because memory data no longer needs to be transferred across the often-crowded link between the (now non-existent) Northbridge chip and the processor. Efficeon and Performance vs. Heat. When designing a processor for a sub notebook-sized computer system, heat becomes a huge concern. It's one thing if you know that the intended environment for your processor has room for the kind of extravagant cooling solutions that companies like Intel or AMD are currently favouring for their chips, but what if you were not even sure that there is room for even a single fan in your customer's design? Transmeta have long taken heat output from their processors as a significant part of its processor classification, and continue to do so with the Efficeon CPU. Transmeta's LongRun dynamic power management technology is an integral part of the plans for the Efficeon. LongRun allows the chipset and the processor to keep a much tighter rein on power consumption. This is accomplished both by further reducing unnecessary power wastage while the processor is idle, and by allowing the code morphing software to analyze and adapt to the power requirements of software applications and tailor the output of the processor to meet those needs by adjusting power supply to areas of the CPU. According to Transmeta, the effects of using LongRun are impressive, especially when the CPU is idle, which is much of the time in a standard system. The Efficeon with LongRun technology consumes just 0.18 of a watt when idle, as compared to a 900Mhz Centrino's 1.45 watts. Over long periods, this can add up to considerable battery savings.